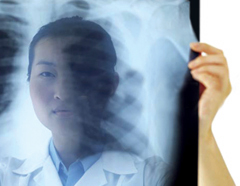 Codonics patented imaging technology outputs superior diagnostic dry film with an unmatched image quality. Our film is the ideal solution for the most demanding medical hardcopy applications. Completely eliminating space between lines by advancing the film in a smooth motion, the diagnostic output is precise and consistent. Our film is available in 14" x 17", 11" x 14" and 8" x 10", giving the user the option to scale the image to the appropriate film size, providing an alternative to print at a lower cost. 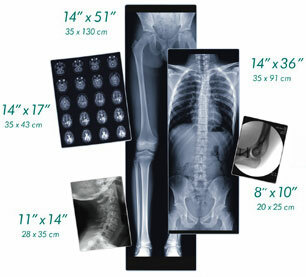 Plus, our exclusive 14" x 36" and 14" x 51" dry film, provides specialized orthopaedics with "digitally stitched" true-size images for long bone and scoliosis studies on one continuous film. Depend on Codonics to deliver reliable, consistent images with the highest quality possible. Completely digital, our unique direct thermal technology achieves image quality better or equal to "laser quality"
In thousands of side by side comparisons, board certified radiologists could not tell the difference between images printed on Codonics imagers from those printed on more expensive laser imagers. Codonics' patented imaging technology outputs diagnostic film and paper achieving unmatched versatility and image quality. Dynamic Media Transport System (DMTS) allows Codonics' imagers to print while the media advances in a smooth motion and eliminates space between lines. Contact your Codonics representative for model configurations and media availability. DirectVista Film is available for use in most Codonics imagers, some model and size restrictions apply. Specifications are subject to change without notice. Contact your Codonics representative for the latest information.